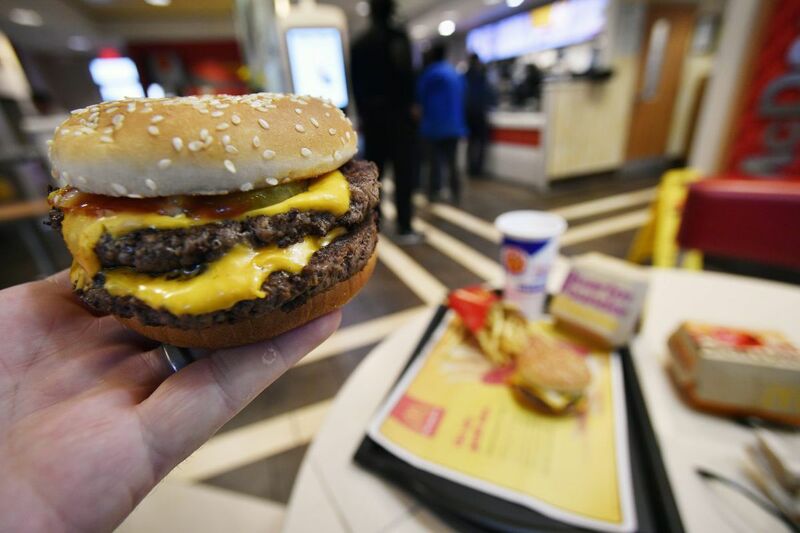 A McDonald's Double Quarter Pounder is shown with the new fresh beef Tuesday, March 6, 2018, in Atlanta. McDonald's is offering fresh beef rather than frozen patties in some burgers at thousands of restaurants, a switch it first announced about a year ago as it works to appeal to customers who want fresher foods. CHICAGO — McDonald's plans to introduce fresh beef burgers in all U.S. restaurants by early May, the fast-food chain's latest move aimed at drawing customers, boosting sales, and propelling the business into the future. Quarter Pounders and Signature Crafted burgers will be made with patties that are cooked upon ordering. All other burgers, including the Big Mac, will continue to be made with patties that are prepared in advance and then frozen. The announcement follows 18 months of testing in order to refine the cooking process so it doesn't result in longer wait times for customers, said Chris Kempczinski, McDonald's USA president. "McDonald's is known for speed and convenience. What we had to figure out is how do you cook only when someone orders it, but do it in a way that doesn't impact service times. When people come to McDonald's, they're not going to wait five minutes for a burger," Kempczinski said at a media event at an Oak Brook, Ill. McDonald's on Monday night. Fresh beef is already available in about 3,500 restaurants in various markets across the U.S., but it won't be available nationwide until the beginning of May, the company said. The company tested the new offering at locations in Texas and Oklahoma. For McDonald's customers, any impact to serving time and price will be minimal, Kempczinski said. For the Golden Arches, the hope is to sustain and even accelerate the company's turnaround. Under Steve Easterbrook, who took over as CEO in 2015, McDonald's has unleashed an array of changes to make the chain more contemporary and relevant to today's consumers. Since the long-awaited launch of all-day breakfast, also in 2015, the Golden Arches has started mobile ordering and delivery, modernized thousands of its U.S. restaurants, introduced premium menu items, and overhauled its value menu, among other changes. This spring, McDonald's is also planning to move from its longtime headquarters in Oak Brook, Ill., to new corporate offices in Chicago's Fulton Market district. Kempczinski, a former Kraft Foods Group executive who also joined McDonald's in 2015, compared the operational challenge of rolling out fresh beef at all 14,000 U.S. restaurants to that of launching all-day breakfast. Time will tell whether the impact is similar, as all-day breakfast provided a significant boost to sales and foot traffic. "I'd love similar results to all-day breakfast, but the customer will ultimately decide," Kempczinski said. On Friday, shares of McDonald's stock fell almost 5 percent after analysts at RBC Capital Markets, disappointed with the early performance of the chain's new $1 $2 $3 Dollar Menu, lowered sales and earnings estimates for the company. But in the research note, David Palmer and his colleagues also noted that the chain could outperform expectations in the months ahead, in part because of the anticipated launch of fresh beef. R.J. Hottovy, an analyst with Morningstar, said he expects fresh beef to be an "incremental positive" on sales and foot traffic, rather than the more significant impact of all-day breakfast. Value items draw more traffic to McDonald's, but premium items, like a fresh beef burger, encourage consumers to "trade up" once they're in the restaurants, Hottovy said. Even in the world of fast food, customers are seeking food they consider to be healthier and "closer to the source," even while looking for a good deal, Hottovy said. "It's a positive that people will recognize," he said. "It does play with a lot of what today's consumers are looking for." Of course, there are other fast-food chains already serving fresh beef burgers. Smaller rival Wendy's has gone on the attack, reminding people on social media — and with a Super Bowl ad campaign — of Wendy's "fresh, never frozen" marketing promise. Chains such as Wendy's, Taco Bell, and Burger King have also ramped up competitive value menu offerings in the last year or so. Like its competitors, McDonald's is trying to offer both value and quality to woo consumers, making some moves in recent years like committing to using only eggs sourced from cage-free hens and, most recently, tweaking the Happy Meals to make them healthier. At the tightly orchestrated media event Monday night, executives and one Texas franchisee touted the quality and potential of offering fresh beef to McDonald's customers. "At the end of the day, McDonald's is a burger company," Kempczinski said. "For us, there is no more important place to focus on improving the quality of our food than the burger."